Winner of the Historic 1699 Winslow House Book Award! 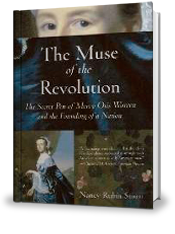 In this lively biography of the first female historian of the American Revolution and our first woman playwright, Nancy Rubin Stuart captures intimate details of Mrs. Warren’s life and patriotic achievements. The sister of firebrand James “the Patriot” Otis, who first declared “taxation without representation is tyranny,” Mrs. Warren was the mother of five sons and the wife of James Warren, Speaker of the Massachusetts House and Paymaster General of the Revolutionary Army. In 1775 the erudite Mrs. Warren served as her husband’s private secretary at headquarters in Watertown, Massachusetts where she heard secret reports about the Revolution that few men —and no women—knew. A close friend of Abigail and John Adams, she and Abigail shared fears, comforted each other in their husbands’ absences, exchanged theories about child-rearing and even ran a small importing business together. So impressed was John Adams with Mrs. Warren’s literary talent that he applauded her “genius pen” and encouraged her to write satirical plays, poems and a history of the American Revolution. Ultimately he got more than he bargained for. After reading Mercy’s long -delayed three volume History of the Rise, Progress and Termination of the American Revolution of 1805, Adams exploded and in one of ten blistering letters, accused her of belittling his importance to the success of the Revolution. This eye-opening biography reveals their complex relationship—and why it unraveled. The Muse of the Revolution captures Mrs. Warren’s bold interactions with other famous patriots, including Samuel Adams, Henry Knox, George and Martha Washington and Elbridge Gerry. Mrs. Warren satirized the British and American Loyalists in her popular plays and poems and wrote an influential critique of the U.S. Constitution, whose principles later appeared in the Bill of Rights. Nancy Rubin Stuart argues for Mrs. Warren’s legacy to be understood and appreciated by a new generation.